More than one hundred delicious and nutritious soups that boast a unique blend of fresh ingredients and surprising spice and flavor combinations–ideal for losing weight, detoxing, or satisfying a craving for comfort–from the former head chef of Yotam Ottolenghi’s renowned restaurant NOPI. There is something special about soup–it has the ability to revitalize and to soothe. A really good bowl of soup puts you in a positive frame of mind and nourishes your body–and it can be the perfect way to jumpstart weight loss. 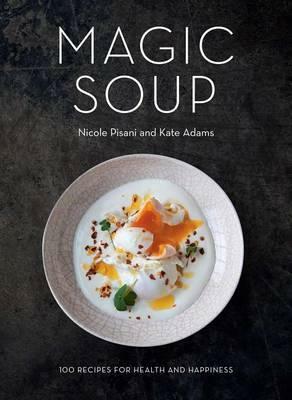 In this gorgeous four-color, fully illustrated book, Nicole Pisani and Kate Adams show that soup is a recipe for health and happiness. Magic Soup is a mouth-watering collection of more than one hundred innovative recipes for stocks and stews, hearty meals, healing bone broths, a detoxifying soup cleanse, and more. Recipes such as salmon poached in lemongrass tea, lemon chicken and mint with quinoa, and the ultimate “chicken soup for the soul” prove that soup can be a filling meal in itself. There’s drool-worthy butternut squash with caramelized pear; delicious beetroot and burrata; and a robust Swedish sailors’ soup made from beef and beer. In warmer months, cool down with watermelon gazpacho and fennel vichyssoise. And get healthy with nettle soup with flowers, a miso soup for each season, and the book’s namesake restorative magic soup of turmeric, ginger, cardamom, cayenne, cinnamon, cumin, spinach, and seeds. Whether you’re swapping a stale sandwich for a vibrant bowl of grains and greens, relaxing over a velvety blend of manuka-honeyed parsnip, cooking rib-eye pho for a feast, or nursing a cold with an Ayurvedic garlic blend–it’s always the right time for soup.